I have my diff cage out to do rear calipers, handbrake, pinion seal, diff cover gasket and misc bushings. I intended to replace the four rubber blocks that hold the diff cage to the body, even though they appear in good condition— no tears or visible deterioration — while I’m at it. Anyway, in comparing the ones I removed to the replacement ones I purchased, it seems they’re very different heights — see the pic. The part number is C17198, from XKs Unlimited in the US. There appears to be only one part number according to their catalog, so I think it’s the right one. So, should I use the new one, because they compress over time which is why my old ones are shorter? Or should I reinstall the old ones and leave it as-is? I’m concerned that the additional height of the new blocks will make installation a challenge, as well as raising the rear ride-height of the car when it’s back on the ground. Any thoughts? Thanks, as always! Don’t refit old worn hardened - and most likely cracked - rubber fittings. The new rubber will compress when you fit them and there would be negligible difference in ride height. Remember to fit the rear mounts to the Chassis “rails”. Then raise the Diff cage which will have the two front mounts already fitted to the Diff cage into the rear mounting studs. The key is to look at your mounting cage to see where the studs will pass through as the rear will hopefully have an elongated slot to facilitate the rear stud being aligned, whereas the front of the cage will just have a hole - through which you will fit the front mountings before lifting the cage into position. I understand later cages - post 1967 had slots at both ends so in theory both front and rear mountings could be mounted to the car first, but I still prefer to mount the front mounting into the cage before raising as access to the nuts and bolts holding the mounting to the cage is harder once in the car. Get yourself some podgers as well, for when the holes don’t line up! I used tapered punches to get the holes properly aligned. What they said. I have an old screwdriver that I have ground to a tapered point. You just hammer it in to one hole, use a jack to tilt the IRS as necessary to get the other one to line up and Bob's your uncle. And remember to bolt the rear mounts onto the cage and the front ones onto the body. Initially I wasn't too chuffed by how the levering of the mounts with the podger bar was scratching the beautiful paint and stonechip on the chassis rails. When I'd got over that, I scraped the incline surfaces clear to bare metal and greased them liberally. That gave me a welcome extra mm or 2 of space and reduced the friction. When the mounts were in place I sprayed Dynax cavity wax in everywhere. This is the tool that solves all these issues. You have to wade through quite a lot but at the end of Post #5 there is a full account. I think mine is still in Edinburgh (Ash ?!) if anyone wants to try it. Just to be pedantic and it may be because Andrew is “down under” that he prefers to bolt the rear mounts into the cage and the front ones onto the body, which is the opposite to what I said, but the key to this is to look at the holes in your cage where the mounting studs go through. In Andrew’s and Rory’s case they have earlier 3.8 cars and the cages then just had two holes front and rear each side, but in 1964 (? ), the cage design was changed to have the rear hole as a slot to make mounting easier. A further design change after 1967, saw both front and rear as slots to assist even further. 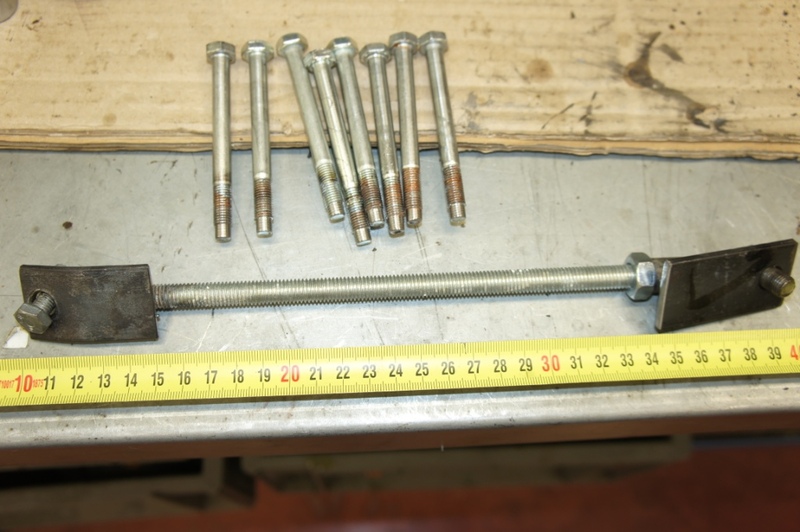 I note in the photos the cage mounted stud has it’s nut fully tightened which is ok if it is through a hole - such as on the earlier cars - but if you have a slot in that rear position, I would leave the nut on that stud and the other nuts and bolts between mountings and cage to be fully tightened once both front and rear mountings are fixed to the chassis and the weight of the car is onto the axle to ensure the stud is correctly aligned in the slot. Thanks again to everyone. My cage has slots in the front and back positions, so I'll take the advice and leave everything a bit loose until the cage is back in place, then snug it all up. Have a few more projects to do before reinstallation - which should be next week - and I'll report back when it's in-place. Followed everyone's advice, grabbed a couple of friends to help, and it's all back in. We levered and pushed and pulled and hammered, and bit-by-bit, it moved into place. In hindsight, like so many projects, it was a scarier prospect in my mind than it was in reality. And as usual, the help off this forum made it all possible. Thanks to everyone for the help. The car drives markedly better than it did prior -- one of the radius arm bushings (the smaller one on the right arm) was completely torn -- and I now appear to have working rear brakes, so it was a job well-done. Now, to figure out why the handbrake -- which worked fine before I "fixed" it -- doesn't work... I have a horrible feeling the whole thing may be coming back out, to adjust the handbrake pawls manually, as the auto-adjusters don't seem to be ratcheting enough to move the pads close enough to the discs. The handbrake lever goes all the way up, and provides barely enough stopping action to hold the car on the flat if you give it a push, let alone a real hill, regardless of how I adjust the cable. I'll probably start a new thread to see if anyone has advice before I have to pull it all out again. 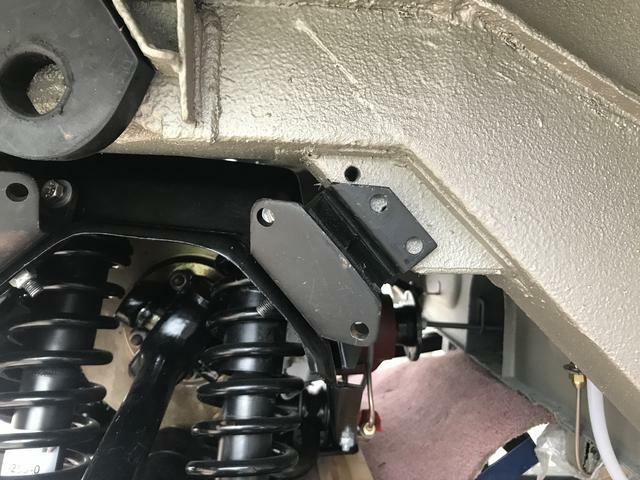 Regarding your handbrake issue, have you fitted the accepted handbrake modification which many of us have done to assist both sets of pads to work more effectively ? In the recent Techical post, “Differential Rebuilds”, at post #7, Mike (Nickleback), has a photo of his back axle showing the modification. 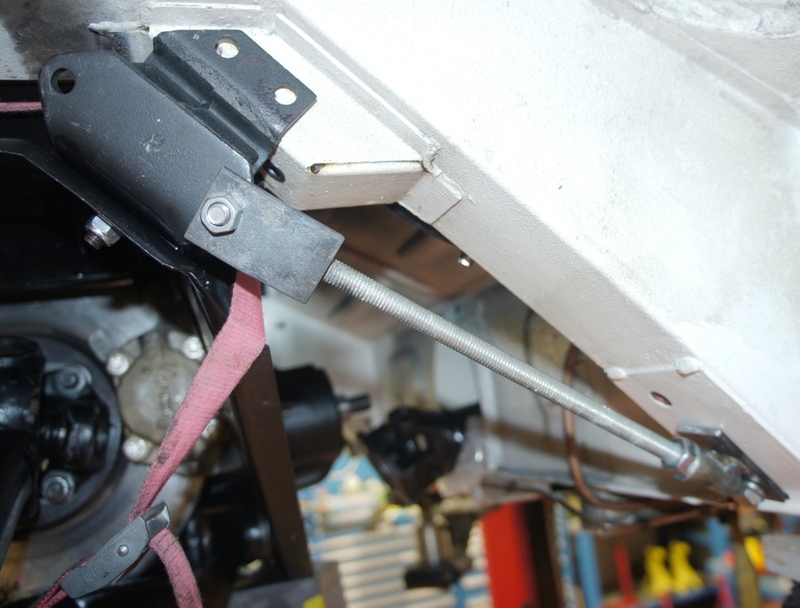 This basically cuts the original support bracket rod and a suitable tube is welded onto it to permit the whole linking assembly to slide within the tube when the handbrake is applied and permits more movement in the assembly as the handbrake pads tighten up. 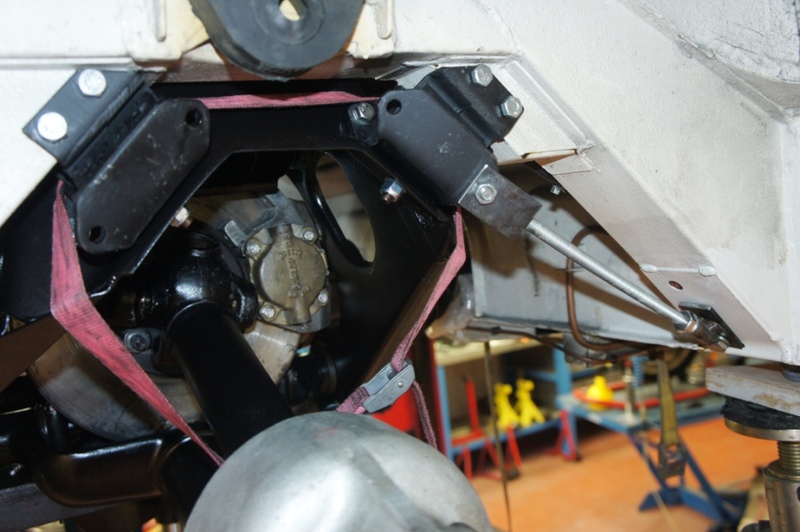 The bracket can be removed from the axle cage whilst in the car to undertake this very simple and effective modification as the two mounting bolts are in captive nuts in the cage. Thanks for the ideas, guys, both useful. I'll get the car up in the air again this weekend and have a look around. Getting the levers to pull further may be the trick, as I know the handbrake worked when I had the cage on the floor -- I used it when tightening up the axle-to-brake-disc bolts. That said, it's a bit bothersome that it doesn't work without the mod, as it worked just fine before I "fixed" it.